Audi's 'Vorsprung durch Technik' advertising slogan celebrates its 40th birthday this year. The phrase, which means 'advancement through technology' was first used in Germany in 1971. At the time Audi NSU made a range of models including the technologically advanced Ro80, powered by a rotary engine, the lightweight Audi 100 and more simple NSU air-cooled models. The company needed a slogan to unify the range, and ‘Vorsprung durch Technik’ efficiently summed up the brand philosophy. As Audi continues to innovate, so it continues to use the phrase, which first appeared in the UK in 1983. It’s now entered our day-to-day language thanks to advertising and appearances in popular culture. It features in songs by Blur and U2, and in films such as Lock, Stock and Two Smoking Barrels. 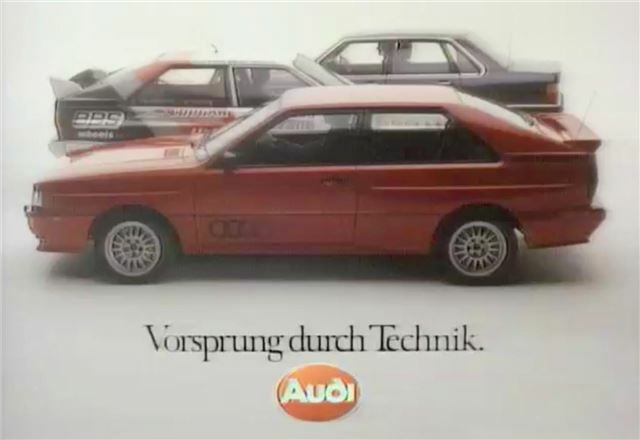 The first UK ‘Vorsprung durch Technik’ advert was show in 1983 and was produced by the London based Bartle Bogle Hegarty (BBH) advertising agency. It’s embedded below.